​The then 82-year-old golfer on how staying with the classic styles helped him dress well his whole life​. It seemed like the guys that were really good always had a neat style for dressing. Hogan, Demaret, Nelson: they were the sharp dressers. My father was an Immaculate dresser. 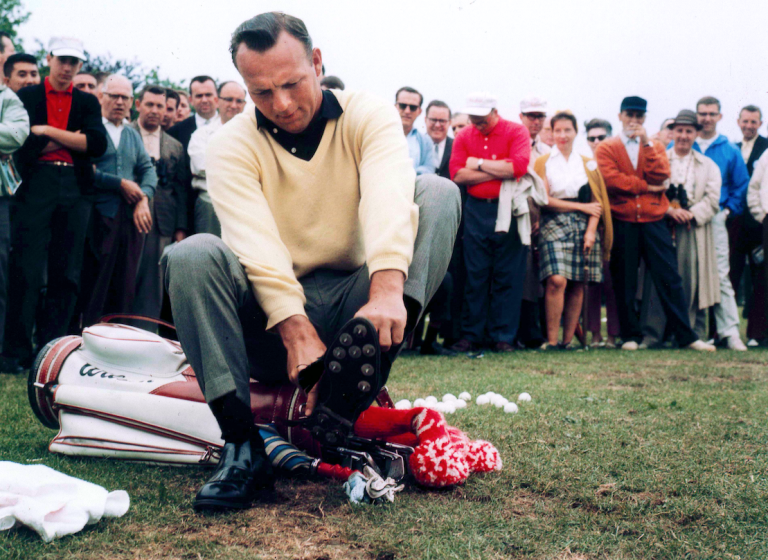 He was a golf-course superintendent, or a greenkeeper, and it might surprise a lot of people to know that one of the things that I used to see him do was shine his shoes. He'd shine his shoes when he got dressed to go out, whatever the occasion, and he could see himself in his shoes they were so shiny, and he used to say, "Arn, you can always tell the character of a man by the shine on his shoes." The crease in his slacks —in suits and in his everyday clothes—it was like a razor blade. And I picked that up from him and developed a style for myself, and I must say that one of the nicest things I ever did was follow in his footsteps. I think there's a relationship between the player and his dress. Does that mean that they all are gonna play good if they dress properly? Well, it doesn't mean that. The sport shirt with the straight collar: That's very important. It takes the sloppiness out of things. I'm an advocate of the unwrinkled straight-collar shirt, creased pants, shined shoes. All of those things are, I think, key to dressing with an emphasis on neatness. Golf is about precision. I stayed with the popular styles through my life, if that's what you're asking. You know, when cashmere became a thing, I wore cashmere. Or when gabardine was of the top line, I wore gabardine. Gabardine holds a crease very well. Cashmere, the first time I got into it was on the Tour in the '50s. But the first time I really got into it was in 1960, when I went to the Open at St. Andrews. All the cashmere factories were in Europe and Scotland, and the pros had an opportunity to go to various clothing makers and buy the cashmere at a pretty good discount. I loved it. We all had cashmere shirts for cool days and cashmere sweaters and pull-overs for cold days. Matter of fact, I still have some of those cashmere items that I bought in the early '60s. It could be better. The pros today should be more aware and conscious of what they're wearing. They should practice dressing—specifically how they dress.